For those of you who are curious – I went on an elimination diet since my sister was doing it to see what was causing her stomach aches. I wanted to support her, but I also wanted to see how it would make me feel. I didn’t eat corn, soy, dairy, gluten, peanuts, sugar, or eggs for awhile, and then reintroduced them into my diet one by one. It was hard, but I felt great and my acne totally went away! Turns out dairy and corn make me break out! So now I really try to avoid dairy and corn. It’s amazing how much your food affects your body and mood. Anyway, thank you for watching! 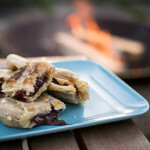 Are you looking for an alternative to s’mores? 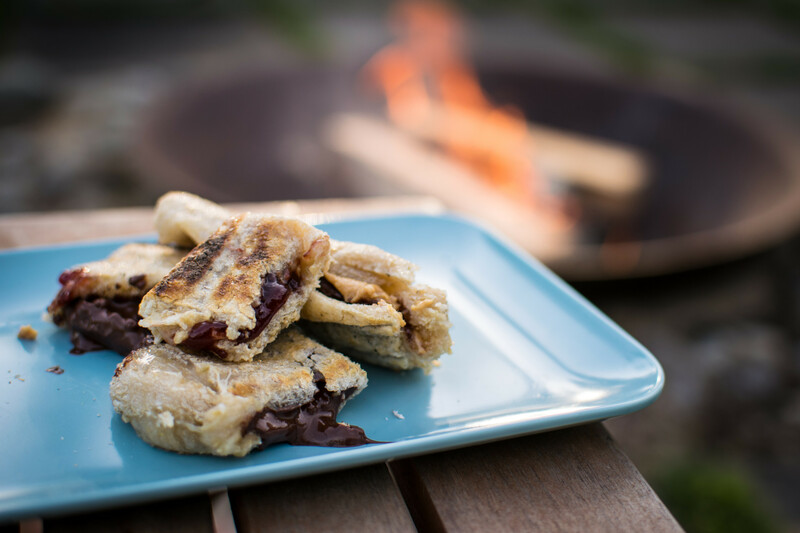 Here’s something that I think is even better than s’mores, and it also happens to be dairy-free, gluten-free, and corn-free! The awesome thing about this dessert is that you can stuff them with anything you want—personally, I love dark chocolate and peanut butter with jam. This is my favorite campfire treat! Mochi, originally from Japan, is sweet rice that has been pounded and dried into shapes. You can get mochi at any Asian grocery store or possibly in the international section in your local store. Sometimes it is in the refrigerated section, so check there if you don’t see it in the aisles. Spray the inside of your grill basket or grate placed over the campfire with nonstick cooking spray. Place several mochi in the basket or on the grate. Roast the mochi, taking care not to burn it, until it’s crispy on the outside and gooey on the inside. Be patient! It should take 5 to 7 minutes. Carefully cut a slit in the side of the mochi, creating a pocket, and stuff with your favorite toppings. Let the stuffing heat up and melt (a minute or so). This also allows the mochi to cool a bit so you can pick it up to eat it. Hi Amber! I loved your video & recipe for the mochi smores. I have sensitivities to gluten, dairy, corn, bell peppers & beans so this was perfect for me. Do you have other videos & recipes for breakfast, lunch, dinner & snacks that might work with my food “lifestyle”? Thx.